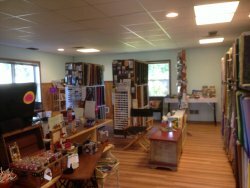 We've gotten everything moved into the new Shop. I can't believe we did it but we did. We will officially be open on Monday, June 23rd. We now have off street parking and central air conditioning. The a/c is much quieter than old "Rex" the dinosaur a/c unit in the old Shop. Works better, too. 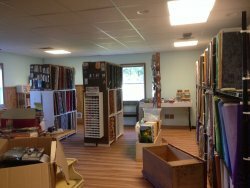 There is more room to move around & you will be able to view our selection of fabric, notions, stencils, rulers, etc. more easily. 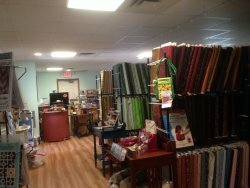 Come in & check us out! We have new fabrics. 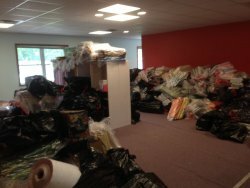 They are somewhere in with the older fabrics. 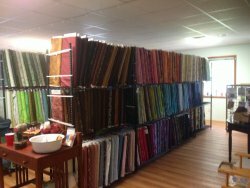 We will have even more new fabrics out on the new fabric racks this week, too. AJ Hudock was our first customer, stopping in Saturday with a quilting emergency. There are too many photos to show so here's some I picked out showing each day. Yes, that is fabric piled up. 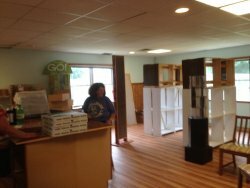 Lunch is here for Day 1 & some shelves are in place. By the end of Day 2, it's starting to look like a Shop. See the new thread that came on Thursday? 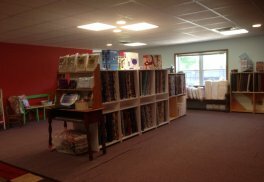 LouElla, Liz & Lauren busted their little butts organizing the fabric. Charlene, John, Randy & Gary just put fabric where the girls said to. Day 3, I think we're ready for Monday. Just need to hang quilts & panels in the Gallery. That won't be done by Monday. When you come visit, please excuse the tools laying around. There is still more to do before I'm done with the renovations. Watch your step & be aware of any air hoses, tools, or extension cords laying on the floor. A.J. Hudock was our first customer. She came in Saturday with a quilting emergency. Row by Row Experience starts July 1st! This year, it's nationwide! We picked Summer as our theme for Row. We will be collecting & displaying the winning quilt that comes into our Shop. It will be displayed until the Shop Hop is concluded. You can only turn your quilt in as a winning quilt in one Shop ONLY, NO MATTER WHAT STATE YOU TURN YOUR QUILT IN. Anyone ready for a picnic? Remember, you have to come into the Shop to receive a free pattern. They can not be emailed, mailed, etc. You may not collect a free pattern for you & your friends. You can, however, buy as many kits as you like. Nor can you buy the kits online. Sorry, that's the rules for the Hop. Check out the website & plan your summer vacation! Wow. I had a lot of information for you this month. Enjoy your Summer & we hope to see you soon. This is the first newsletter out of the new Shop,too.